People often ask if book conservators get distracted reading the books we're working on, but the truth is, we often pay little attention to the contents because the object is the focus. I can't tell you for how many books I could tell you everything there is to know about the paper, the leather, the ink, and the structure, but can't remember the title. Every once in a while, though, we get something in that we can't help lingering over. 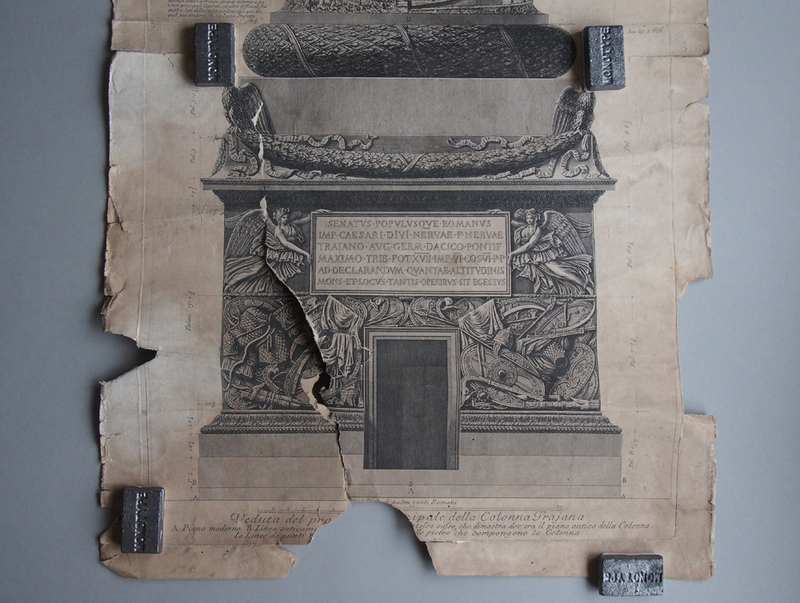 As an undergraduate printmaking student at the Maryland Institute College of Art I discovered Piranesi's Views of Rome and Carceri at the George Peabody Library and spent ages looking at his mark-making and way of bringing life to Roman ruins. 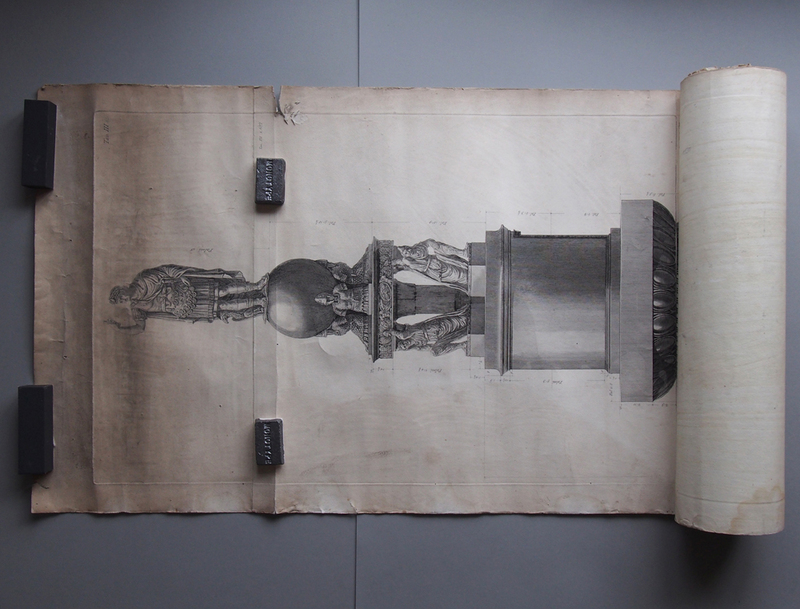 A very kind librarian would appear from time to time with a flat light to slip under the paper so I could see the watermarks & paper quality, or a magnifying glass, or another set of prints he thought I might like to see. Imagine the fun he must've had with the column and the leaves after all those tiny bricks! Like most things stored in a roll for a long time, it's more dirty and damaged at both ends, particularly at the bottom end, than in the middle. Where the thick paper is joined, and therefore double stiff plus the stiffness of the glue, there are tears starting to happen at either side of the join—that's the lesson of why we don't like to make hard boundaries of stiff and less stiff in paper conservation. There are some nasty tears at the bottom end with a few areas where part of the image is missing. At some point while it was rolled up water got onto the right end, leaving a series of matching stains along the length when unrolled. On the verso we can see brush marks, and looking closer, a film of cracked animal glue that would have once held it to a textile backing. 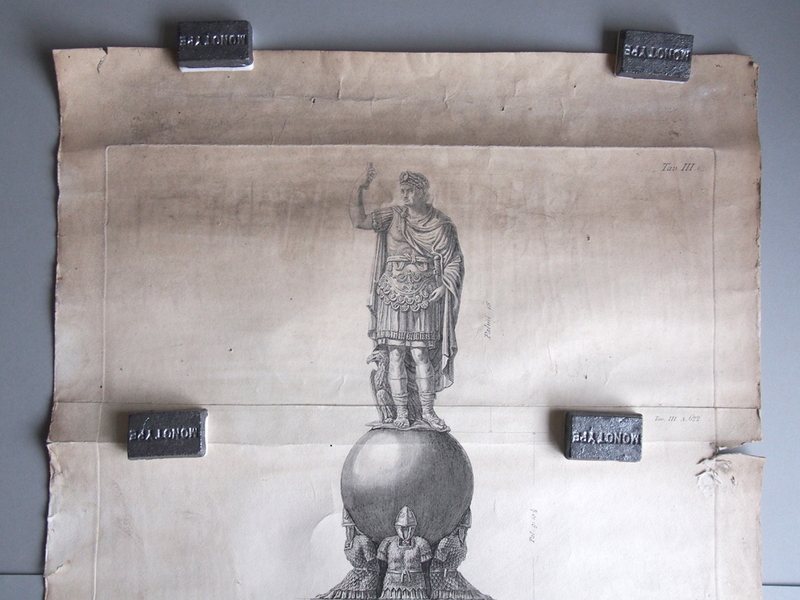 It's normal to find large things like this mounted to canvas of some sort for extra strength in hanging, but there are often problems created by the two materials responding differently to moisture. In this case, the backing has already been removed, but not very well, leaving huge patches of skinned paper that are the perfect receptacle for dirt. 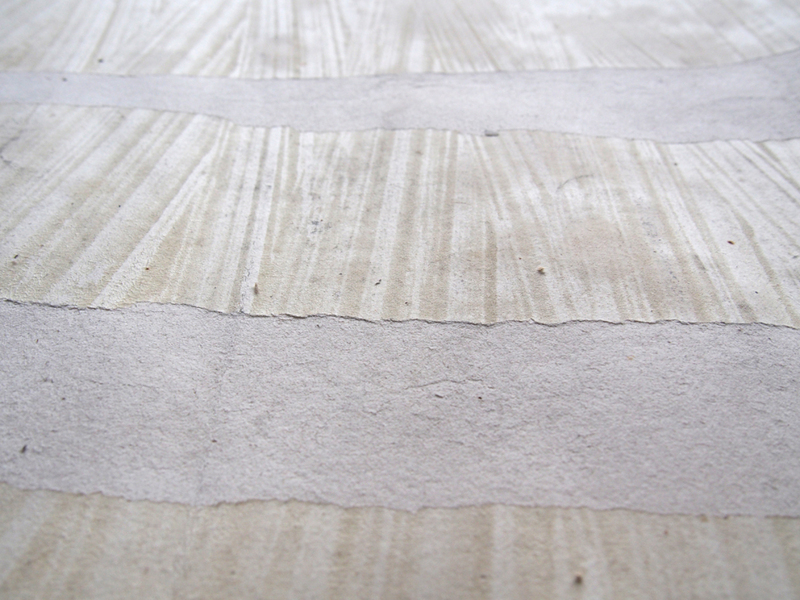 We're hoping that washing the print—yes, you can wash paper!—will help remove some of the discoloration, as well as relaxing it so it will lie flat again, and providing an opportunity to remove all that animal glue from the back. The first step is surface cleaning; any surface dirt really embeds into the fibers during the washing process if it is left in place. 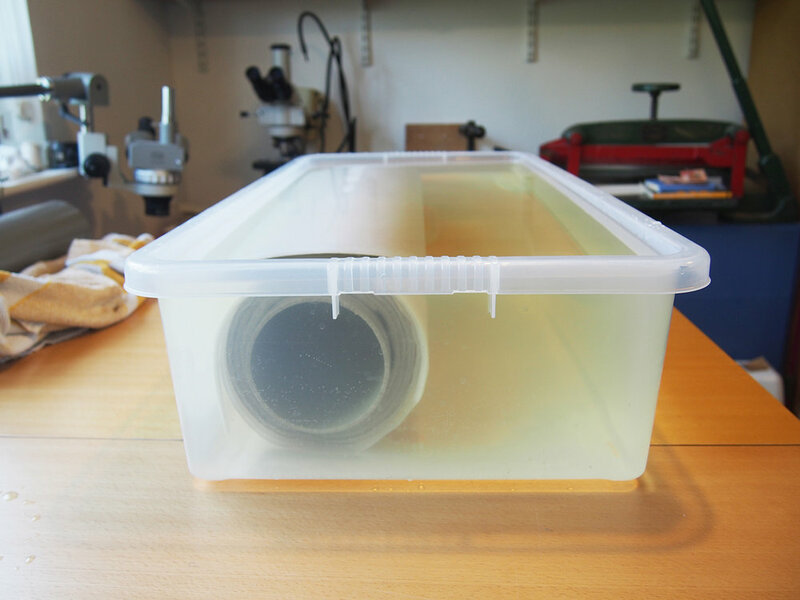 Then we humidify the print, so that it starts to take up some water into the fiber structure and there is not such a shock when we put it in water. For that, and the washing, we're going to have to think of something clever, because when unrolled it doesn't fit into any kind of normal supports. Oh, or my bench. I think it just about fits in the studio. 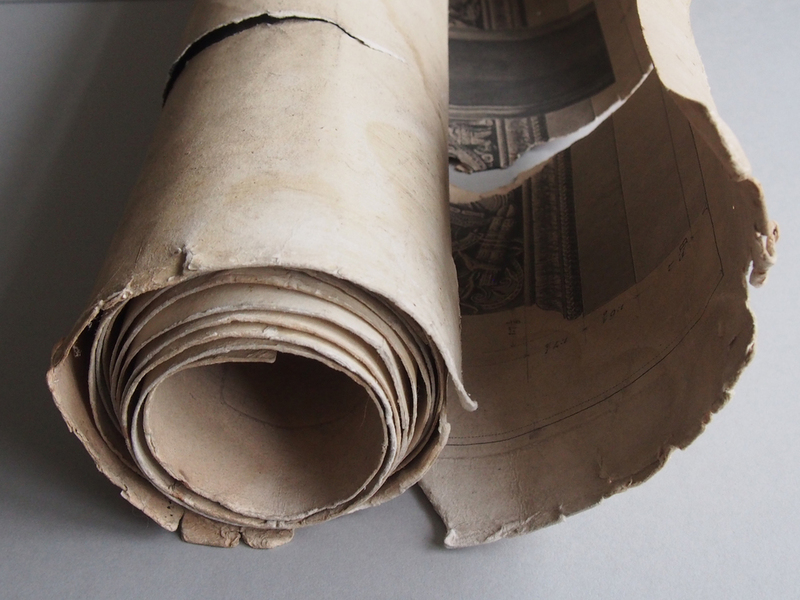 When all the paper repairs are complete, we'll frame it, to protect it and so the clients can actually see it again. Stay tuned!